It's Gloria from Girlia's Cards again this week. I am so glad you decided to take a peek at this card. I am in the process of getting my CHRISTmas cards prepared for the upcoming season. I just could not resist this cute little dove. It was just three layers so simple and then put on an action wobble and this little dove is in motion. Theresa the Scrapbooking Queen is ready to place your order at the Royal Castle Shoppe and then you can set your card images in motion. 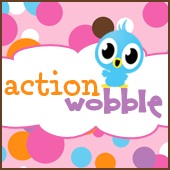 Don't forget you can enter your cards in the Action Wobble Challenges taking place on Wednesday's or Wobble Wednesdays. Don't forget there is something new for you to see everyday so come back tomorrow to see what is on the Action Wobble Design Team blog for your inspiration. Enjoy and GOD Bless.